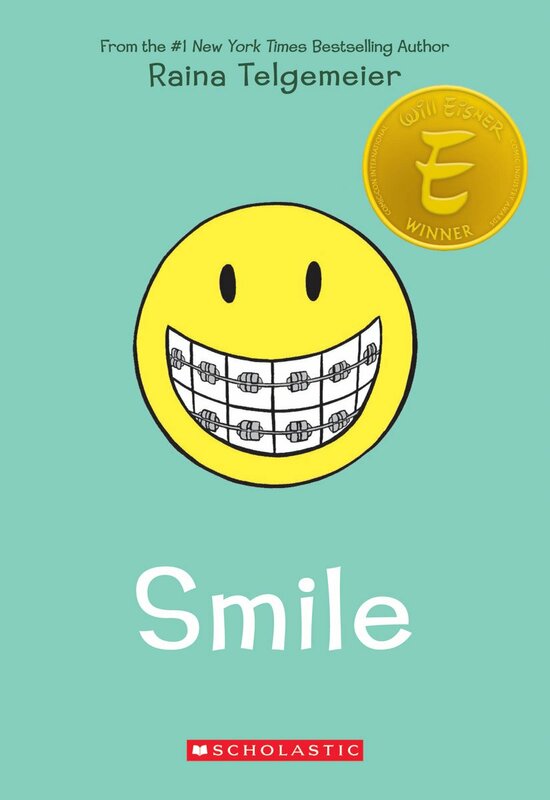 This week’s Teaser Tuesdays is a book called Smile by Raina Telgemeier. I haven’t had much luck with graphic novels in the past. I find them too busy and it is hard for me to get absorbed in the story. It’s like my brain doesn’t know where to focus and I just get frustrated. Well, the search is over because I have found a graphic novel I LOVE! This is the first Teaser Tuesday I have done on a book I have finished. I loved it so much I read it in one sitting. I couldn’t put it down last night (it’s an easy read but still). It’s just great! It tells the story of Raina’s childhood through the lens of her extreme dental work. She is just a hair older than me but I related so much to everything she shared. It feels very real. Everything from her losing and getting new friends, to loving Little Mermaid and discovering what she wants to do in life, to having crushes on boys. It was just completely delightful. My sister said my niece just rereads this book over and over again and I can see why. I LOVED it and I don’t love books that often. It was funny, sweet, honest and heartfelt. I loved the illustrations and would honestly love to see it made into a TV series. It’s just great! I can’t say enough good things about it. Have you read Smile? Let me know in comments section. This looks so interesting! Now I definitely want to read it.